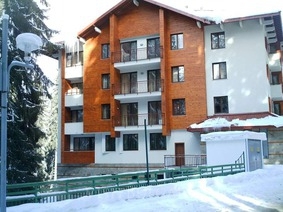 Location: Royal House apartment complex is situated in the center of Pamporovo on the main road between Grand Hotel “Murgavets” and hotel “Pamporovo”. It is four storey building with underground garages, two elevators and 29 apartments, furnished according to the standards for four star qualities. - 7 apartments (1 bedroom, living- room with folding sofa, kitchen, satellite TV, luxurious bathroom with shower cabin or bathtub and a hairdryer). - 22 VIP apartments (2 bedrooms, living room with folding sofa, kitchen, satellite TV in each of the rooms, luxurious bathroom with shower cabin or bathtub with hairdryer).